A 1932 Packard Twin Six 906 Individual Custom Convertible Sedan is a highlight at the Gooding Scottsdale 2017 classic car auction in Arizona, USA. This Packard, originally owned by Al Jolson, is one of only two with Dietrich coachwork and has an impressive Pebble Beach Concours d’Elegance participation record. 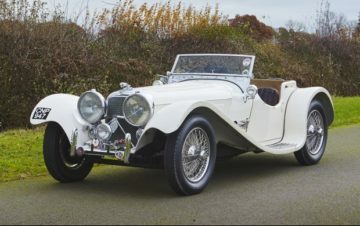 Other classics with celebrity provenance announced for the Scottsdale 2017 sale include the 1938 Jaguar SS 100 3 ½ Litre owned by Today Show Host Dave Garroway, and the barn-find 1958 Porsche 356 A Super Speedster owned by disc jockey B. Mitchel Reed. The 1932 Packard Twin Six 906 Individual Custom Convertible Sedan (Estimate Upon Request) will be one of the star cars on offer at Gooding Scottsdale 2017. It will compliment the other pre-war classics Gooding announced previously and compete with the 1933 Chrysler CL Imperial Dual-Windshield Phaeton (Est. $1,400,000 – $1,800,000) on offer at RM Sotheby’s Arizona 2017 sale. The beautiful V-windshield 1932 Packard is one of only two Twin Six 906 Individual Custom Convertible Sedans in the world with sensational coachwork by Dietrich. Al Jolson, legendary entertainer and one of Hollywood’s first superstars, had this bespoke Twin Six custom built for him and delivered to his Los Angeles home. By 1959, the Packard was acquired by well-known enthusiast Harold Crosby, who comprehensively restored the custom bodied Packard to debut at the 1963 Pebble Beach Concours d’Elegance®. The car won its class and went on to be named Reserve Best of Show. Following Mr. Crosby’s ownership, Robert Friggens purchased the car in 1972 and enjoyed the Packard for 39 years until selling it to David Kane. Mr. Kane restored the car to its original splendor of dark gray over brown leather interior. Following the restoration, the Packard returned to the prestigious show field at the 2012 Pebble Beach Concours d’Elegance®, nearly 50 years after its first appearance there, where it placed First in Class. 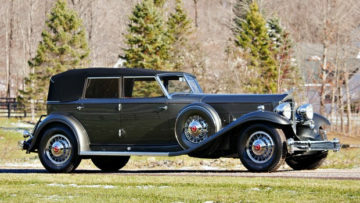 The signature V-windshield Dietrichs are among the most exquisite of all Packards, with its fascinating provenance and award-winning presentation, this Dietrich-bodied Packard is an unrivaled offering for the true connoisseur of fine motorcars. The 1938 Jaguar SS 100 3 ½ Litre (Estimate: $450,000-$525,000) once belonged to the first host of NBC’s Today show Mr. Dave Garroway, who had the seats and interior covered in alligator skin. SS Cars Ltd. – the precursor to the Jaguar marque – created the SS100 as the first model to feature the Jaguar name, and the first car to achieve the over 100 mph threshold. The car was sold new to Mr. H.P. Terry of England, dressed in Gunmetal Grey over silver interior. Mr. Terry enjoyed and raced the car with success until he shipped the SS100 to the US in 1948 to be acquired by famous broadcaster and the first host of NBC’s Today show Mr. Dave Garroway. Dave Garroway redressed the car in an off-white exterior color and eventually replaced the original engine with the first independently sold DOHC XK 120 engine, which he modified to increase power output. In 1954, Mr. Garroway purchased six full alligator skins and covered the seats, steering wheel and dash in the beautiful brown hide, as can be seen today. The Today show host sold the car in 1978 after three decades of ownership to collector Steve Sim Roberts, who chronicled its history and had the Jaguar featured in over 70 magazine articles. Mr. Roberts sold the SS100 in 2007, where the car was sent back to England to obtain a Jaguar Daimler Heritage Trust Certificate, as well as comprehensive, yet sympathetic re-commission by DK Engineering. This unique 1938 Jaguar SS 100 3 ½ Litre is turn-key and ready for the collector who has a deep passion for the marque and appreciation for rich provenance. The 1958 Porsche 356 A Super Speedster (Estimate: $200,000-$275,000) is a true garage find and will be offered at Gooding Scottsdale 2017 without reserve. With its sleekly raked, cut-down windshield, tasteful chrome work and track-oriented handling, the 356 Speedster gained favor with enthusiasts immediately. Hollywood stars and professional athletes also flocked to the beautiful and sporty Speedster. 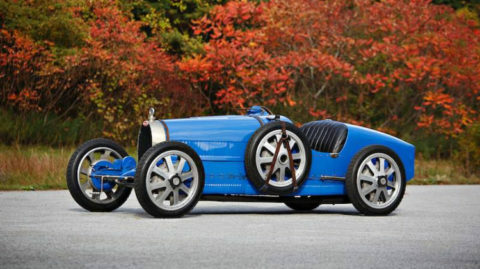 The car presented here is a final-year Speedster that benefits from the model upgrades made that year including improved rear suspension design, quicker steering, and a 1,600 “Super” flat four engine that produced 75 hp. The 1958 Porsche 356 A Super Speedster was purchased from the original owner by B. Mitchel Reed, a well-known Los Angeles disc jockey, and his wife. The two enjoyed the Speedster for about 12 years until it was purchased by its current owner in 1970. The current owner purposely resisted the urge to have the car’s body refinished in shiny new paint, believing that it would make his car less tempting to thieves. After draining the oil and removing the battery, he garaged the Speedster in 1974. It sat there for the next quarter-century. He moved in 2000, taking the Porsche with him and again placing the Speedster in his garage until 2016, when he decided to part with the car. 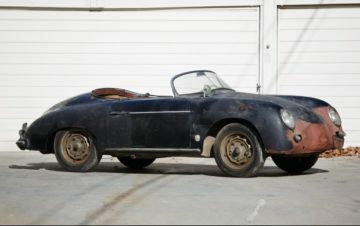 This 1958 Porsche 356 A Super Speedster epitomizes the term “garage find,” having been stored for 42 of its 58 years. A solid Southern California car, this final-year Speedster provides the next owner with a fantastic candidate for a concours-correct, factory-specification restoration. 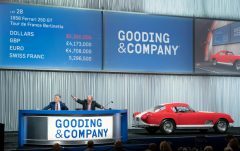 Cars previously announced by Gooding for its 2017 Scottsdale sale include pre-war classics such as a 1925 Bugatti Type 35 Grand Prix car and a 1932 Alfa Romeo 6C 1750 Grand Sport Cabriolet; several very desirable sports cars including a 1967 Ferrari 75 GTB/4 and a 1955 Mercedes Benz 300 SL Gullwing; and design-driven sports cars such as a 1966 Ferrari 275 GTB Long Nose Alloy, a 1965 Ferrari 500 Superfast and a 1969 American Motors AMX/3.